Had he still been alive, December 15, 2010 would have been Stan Kenton's 99th birthday. Through much of the past few decades, it's arguable that no other jazz musician has had as much influence on the world of drum corps as this great pianist, composer, big band leader and clinician. After touring as a pianist during the 1930s with dance bands under the leadership of others, Kenton formed his first band in 1941, the year the United States was drawn into World War II. Some 35 years later, he was still touring the world with his band and introducing new works into the jazz repertoire that would become standards in the drum corps lexicon. Prior to Kenton, jazz bands were typically referred to as dance bands … the purpose of the ensembles being to provide music that was more to be danced to than listened to. Kenton changed all that with his "progressive jazz orchestras," getting people to sit down and concentrate on what was happening on the stage instead of focusing on what they were doing on a dance floor. When Kenton brought his first band to New York in 1942, the dancers complained the music was too loud and the tempos too fast to dance to, which undoubtedly pleased him. No other big band leader went through as many incarnations as Kenton did; nor did any front as many different ensembles. His earlier "Artistry in Rhythm" years focused on what now seems to be fairly traditional jazz styles with a standard band instrumentation of 16 to 19 members. In 1950, everything anyone thought they knew about jazz was turned upside-down by his 39-piece Innovations in Modern Music Orchestra, which featured 16 strings and introduced trumpeter Maynard Ferguson to the world. A young composer named Bob Graettinger offered a short work to Kenton in 1947, which Kenton then recorded. From this early collaboration came the Innovations in Modern Music Orchestra's "Incident in Jazz" and "City of Glass," major components in the Blue Devils' 2010 production, "Through a Glass, Darkly." The show, which featured music recorded by Kenton, was as stunning and daring in 2010 as it was 60 years earlier, when it affected jazz fans much in the same manner as Stravinsky affected classical listeners in 1913 with "The Rite of Spring." Many were intrigued, many were overwhelmed, and many were just plain honked off. Musicologist Gunther Schuller, himself a composer of "Third Stream" music that blurred the lines between symphonic and jazz idioms, stated that "City of Glass" contained "almost no jazz material, certain not from any conventional point of view." From the 1950s on, Kenton typically formed a band for one year, toured with it, and then disbanded it until forming his next year's touring band a few months later. This allowed him to experiment with the strengths of a multitude of different performers. Along the way, he introduced new instruments such as the early 1960s mellophonium, which was neither a trumpet nor French Horn, but seemed to be louder than either. As he did with Graettinger, he particularly loved to introduce to a wider audience base composers such as Hank Levy, Johnny Richards and Pete Rugolo, (who had already written for Johnny Richards' earlier band). He also introduced many new styles to American audiences and was among the first to legitimize Afro-Cuban influences, including its rhythms and heavy Latin percussion. Between his Stan Kenton Clinic residencies during much of the summer and his touring the rest of the year, he didn't bother maintaining a home. It was easier to just check into a hotel when he got back to his hometown of Los Angeles. Due to his hectic schedule created by his decades-long dedication to working with young jazz musicians at his clinics, (typically over 100 clinics a year in addition to multiple week-long college residencies), he influenced countless jazz artists and spread his musical mission well beyond his lifetime. When Capitol Records let many of his older recordings go out of print, he established Creative World Records in 1970 and started selling his new recordings by mail through a print catalog, a radical sales model for the time. This is likely how many drum corps arrangers first came across so many of his recordings that eventually made it to the drum corps field. It would be foolish to attempt to create a complete list of compositions and arrangements performed by drum corps that had originally been performed by one of Kenton's bands. Such a list would invariably contain omissions both big and small. However, there are several Kenton works that I personally find memorable. In 1974, Anaheim Kingsmen delivered Kenton's own "Artistry in Rhythm" as a screaming "push your hair back" concert standstill. The intensity level was one of the highlights of the season and worthy checking out on DCI's Fan Network if you haven't heard it. Crossmen also performed the piece in 1982. In the mid-1960s, Kenton's Los Angeles Neophonic Orchestra brought together many of the best LA studio musicians to record original music by composers who were relatively unknown, including John Williams … yes, that John Williams. Hugo Montenegro's "Fanfare" (also known as "Fanfare for the New") is a brash jazz work with overtones of Copland. It was introduced to the DCI Finals by Argonne Rebels in 1973 and was played by Blue Devils in 1987. The Argonne version is notable for DCI Hall of Fame member Sandra Opie's brass line articulateness and clarity, but for my money, Guardsmen's banner year of 1979 provides the definitive "oomph" for this work, featuring a horn line written for and instructed by a young Tim Salzman, before he made his mark working with Santa Clara Vanguard and then arranging for the Cavaliers. Hank Levy came to the notice of corps fans when the Blue Devils played "Pegusus" in 1980, 1982 and 2007. Corps fans remember the work for the introduction of the massive wings utilized by the guard that were brought back to the field in 2007's "Winged Victory" show. The corps also performed Levy's "Latin Implosion" in 1984 and "Chain Reaction" in 1993. Although Johnny Richards already had his own big band, he came to prominence by writing fiery works for Kenton that often relied on screeching trumpet motifs that risked busting the performers' lips. His "Adventures in Time" filled Suncoast Sound's entire 5th place 1986 show, a brass tour-de-force arranged by Robert W. Smith. One of the movements, "Commencement," was played by a number of World Class corps, including Freelancers in their first two DCI Finalist years of 1976 and 1977, The Cadets in 1981 (in what was up to then the corps' highest placement of 7th) and Blue Devils in 1991 and 1995. "Adventures in Time" and Richards' treatment of "West Side Story" were from Kenton's mellophonium years; Richards' version of "West Side Story" was featured in the programs of a plethora of DCI Finalist corps over the years. (The most notable was the Cadets' 1984 show, which combined Kenton's version with a number of other renditions and really brought to the fore George Zingali's wild and unique "flex drill," featuring the sudden company front in "Tonight" that still seems surprising when viewed.) Richards' "Cuban Fire Suite" has also been popular with drum corps. "La Suerte de Los Tontos" was introduced by Blue Devils in 1979, the same year it was presented by The Cavaliers. The piece became a BD trademark and was brought back in 1980, 1992 and was hinted at in the corps' opening statement this past season. The corps' 1992 "Big, Bad and Blue" show also featured "El Congo Valiente" and "Fuego Cubano" from the same suite. Bill Holman was long one of Kenton's favorite composers. His "Malague?±a" is an arrangement of a previously existing melody and has all but become a trademark of the Madison Scouts, who performed the exciting blood-boiling warhorse in 1978, 1980, 1981, 1988 and 1996. You can also find the work on the Fan Network performed by the Muchachos in 1974, Blue Stars in 1976, Velvet Knights in 1988, Boston Crusaders in 2003 and in the Cadets' "Our Favorite Things" 2003 production, which combined the Kenton version with Morton Gould's symphonic interpretation and Percy Faith's dance band version. 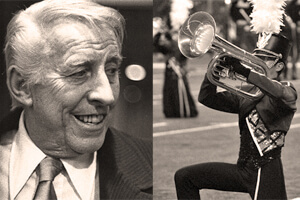 Holman's "Malaga" was performed both by the Argonne Rebels and Blue Stars in 1973, then Oakland Crusaders in 1976, Blue Stars again in 1978, Freelancers in 1981, then Madison Scouts in 1994, 1995, 2004 and 2009. Fans still talk about the Scouts' 4th place 1995 show as being one of the most powerful and popular productions ever. (Though not titled at the time, it later became generally known as "A Drum Corps Fan's Dream: A Day in the Life of a Bull Fighter.") No one who saw the show can ever forget the stunning wedge block turn-around at the end of "Malaga." Bob Curnow is now a famous jazz composer and arranger. He got his big break in the mid-1970s when Kenton had him arrange "Chicago III Suite" for the album, "Kenton Plays Chicago." The suite was a big part of Blue Devils' shows in 1978 and 1979, with the individual selection "Free" brought back in 1980 and 1987. "Free" provided for one of the most famous DCI drill moves of the 1970s when two rotating circles symmetrical to the 50-yard line broke apart and attached on to the moving arcs behind. If you haven't seen this maneuver, it's worth checking out. One of Kenton's most popular ballads was Dee Barton's treatment of "Here's That Rainy Day," performed four times by the Sky Ryders, including the corps' second year in the World Championship Finals in 1983. Over 400 recordings were made of David Raksin's theme to the film noir "Laura," and Kenton didn't miss out on getting aboard the bandwagon. His haunting rendition was heard alongside other Kenton works such as the aforementioned Graettinger selections in Blue Devils' 2010 show, providing intense discussion and debate over music that is as controversial now as it was six decades ago. Many famous performers went through the Kenton personnel roster, and at least a couple of them went on to have successful careers as bandleaders. Trumpeters Maynard Ferguson and Bill Chase produced albums that contained selections that became popular with drum corps. Kenton toured with his orchestra until August of 1978 and passed away on August 25, 1979, one week to the day after Blue Devils won their third DCI World Championship with "Chicago III Suite" and "La Suerte de Los Tontos." Stan Kenton was certainly no stranger to drum corps arrangers and members, but he also was very much aware of drum corps, as noted in the following clip from a 1973 documentary following the Santa Clara Vanguard through the summer season. He had much respect for the musical education aspect of drum corps. It's impossible to imagine drum corps without his influence, his vast repertoire, and his commitment to producing jazz that was often beloved, sometimes controversial and always fresh and imbued with his unique signature.